After a morning of chores on our last full day at Figeac, Francine planned an afternoon excursion up into the hills to visit Peyrusse-le-Roc, an old silver mining settlement. Whilst not hair-raising, the 20kms journey was, shall we say, “interesting” in the narrow road took several S-bend turns under single carriageway railway bridges, very effectively blinding one to any oncoming traffic that there might be. Happily, we made it unscathed with some use of the horn to warn of our approach. Peyrusse-le-Roc comes in two halves. Slightly lower down the slopes lie the remains of the old mediæval village abandoned around 1700. 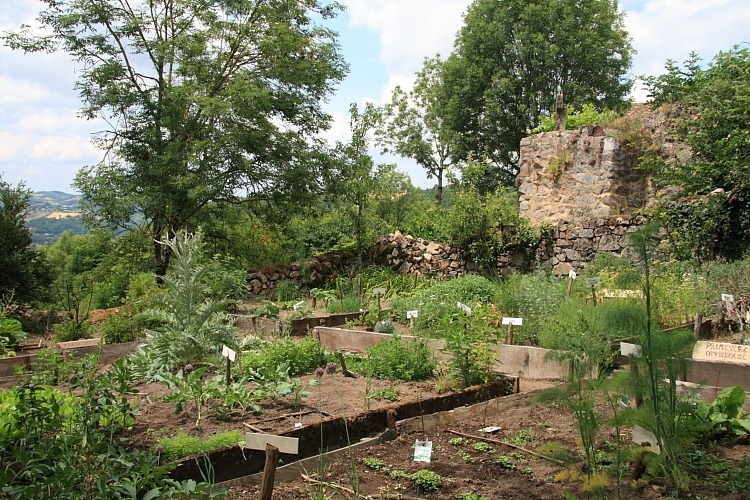 The Rough Guide says that this old village is gradually being excavated and restored. Above the old village and atop the hill lies a newer village which, we found out when we arrived, also appears to be subject to some serious restoration work. 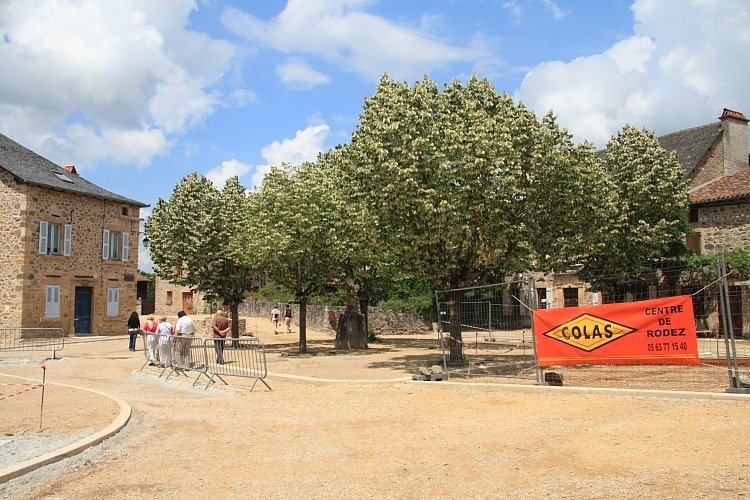 The main square is a complete construction site sporting barriers and raised kerb stones in place of anything resembling any road surfaces, and the Mairie, just off the square, is hidden behind a large pile of gravel as though it, too, is still being worked on by the builders. I suspect the gravel is actually destined for the square but the effect is one of complete chaos. Francine wandered down one of the narrow, steep alleyways following a sign to a “mediæval garden”, whatever one of those is. Having struggled up a steep incline to get from the car park to the village, I was darned if I was going to follow to see a few old plants, only to have to climb back up again before descending once again to our car. In staying behind, I missed a little French humour. 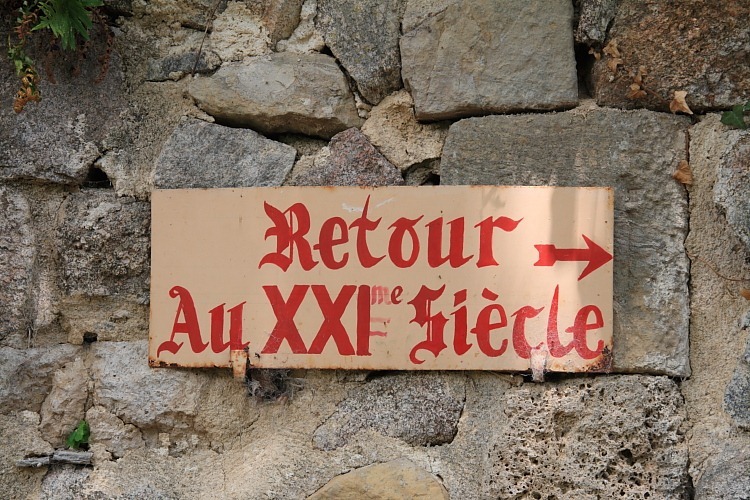 On the exit from the mediæval garden was a sign saying, “Retour au XXIme siècle” [Return to the 21st century]. Clearly, the sign had been there at least 11 years because it obviously used to read “… XXeme…” and what it should now have said was “… XXIeme …” but, in a new millennium economy drive, the “I” had simply been added over the first “e” of “eme”. No matter, it was fun anyway. Maybe when they’ve finished restoring the village they’ll be able to afford a new sign. 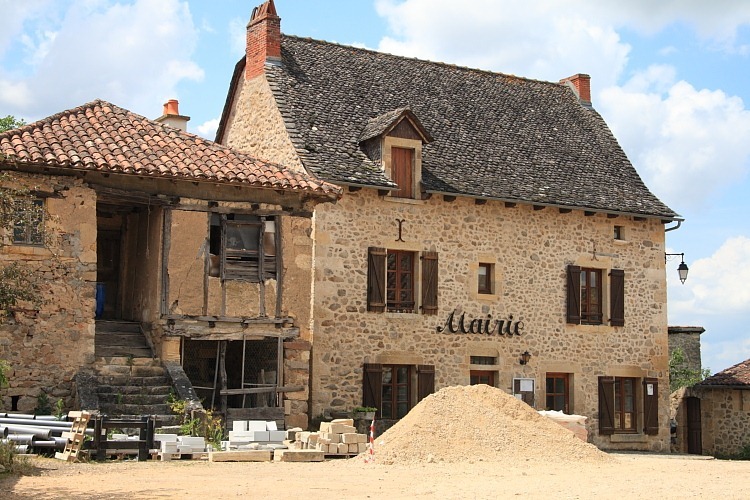 Our advice concerning Peyrusse-le-Roc is, don’t bother until it’s finished.